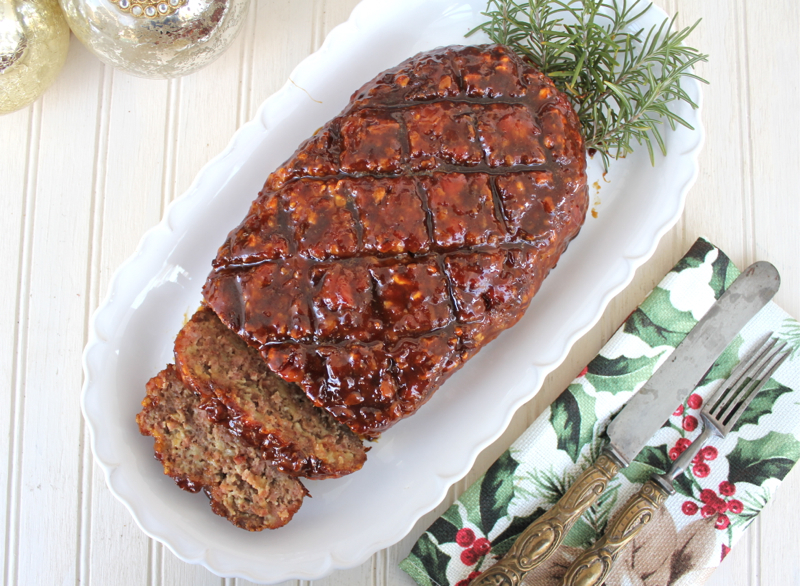 Nothing brings back memories of home more than this sticky glazed ham loaf. My Mother made this for many special occasions. Forget the prime rib roast or the whole filet of beef. To my Mother, a celebration required ham loaf. We are not sure when she latched onto this dish. We just always knew that it would be served when she gathered the family together for a holiday. I don’t make it often anymore. But at least once a year I have to make it, if for no other reason than the smell of it cooking takes me back to her kitchen. 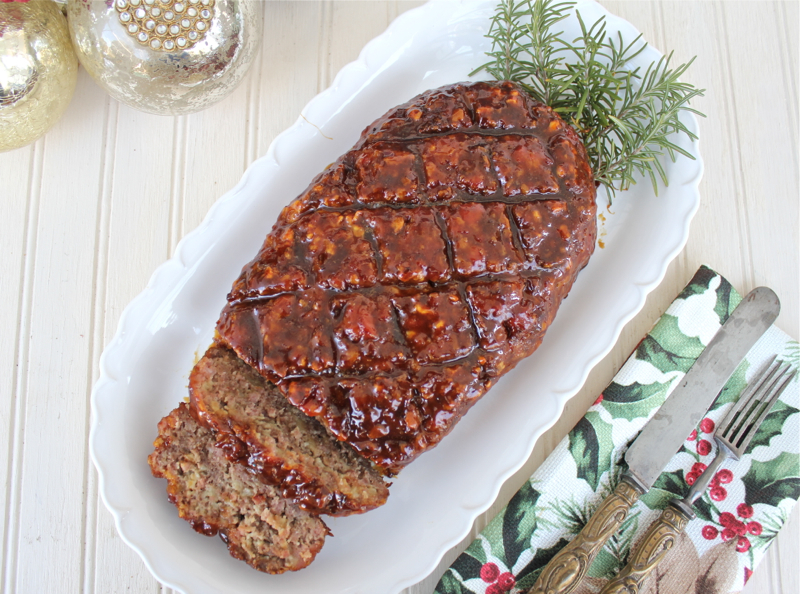 She basted it often with the glaze and, at the end, it caramelized into the sweet coating that was one of her favorite parts of the ham loaf. She always made two loaves so that she was assured of at least one of the end pieces for herself. Scoring the top of the ham loaf looks lovely and also holds the glaze better. It makes a festive presentation and tastes wonderful. The ham loaf is a mixture of ground round and ground ham. There was a time when you could ask the butcher to grind a ham steak together with the ground round, but not anymore. For some reason, most supermarkets will not do this. I either grind my own ham in my Kitchen Aid with the meat grinder attachment or buy a tube of ground ham. I just discovered this product. You may find that small supermarkets will be more willing to grind a piece of ham. However you arrive at the mixture, you will not be disappointed. On anther note, one of the things I try to do during the holidays is to support local businesses. The big box stores are not in danger of losing customers, but by supporting small businesses we can make a big difference. We were very impressed with this young entrepreneur who showed up on our doorstep one evening. 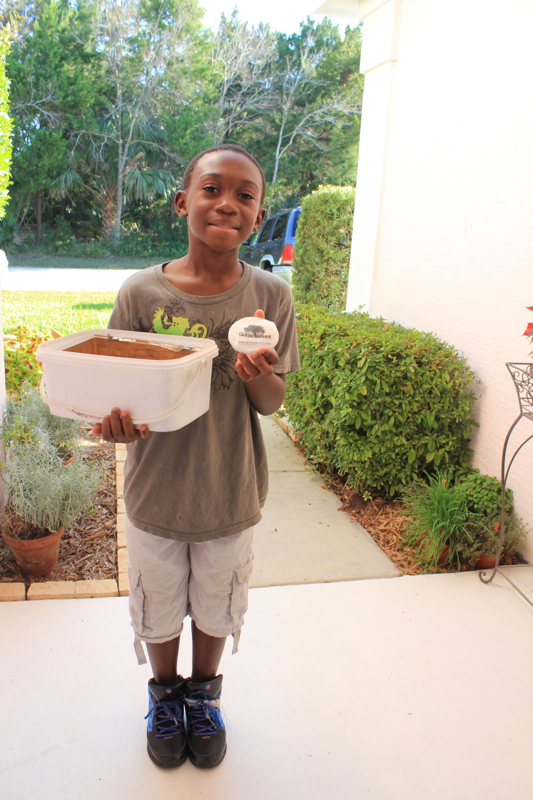 Eldred Williams is 8 years old and with his brothers and father have started a soap company featuring soaps with all natural ingredients. He was engaging and enthusiastic about his soaps. The name of the company is Gone Natural; 4 kids and a Father. Check out the link for more information. I am very happy with the soap that I bought. Hopefully, this young man has a bright future. With his attitude, he is well on his way. Here is the recipe for my Mother’s Ham Loaf. She would have been proud to share it with all of you. For me it represents family, fellowship and one of the things that is important about the holidays. Combine the first 5 ingredients in a large bowl. I sometimes combine the ground meats before adding the rest. Form into a loaf and place in a 9″x13″ baking dish. 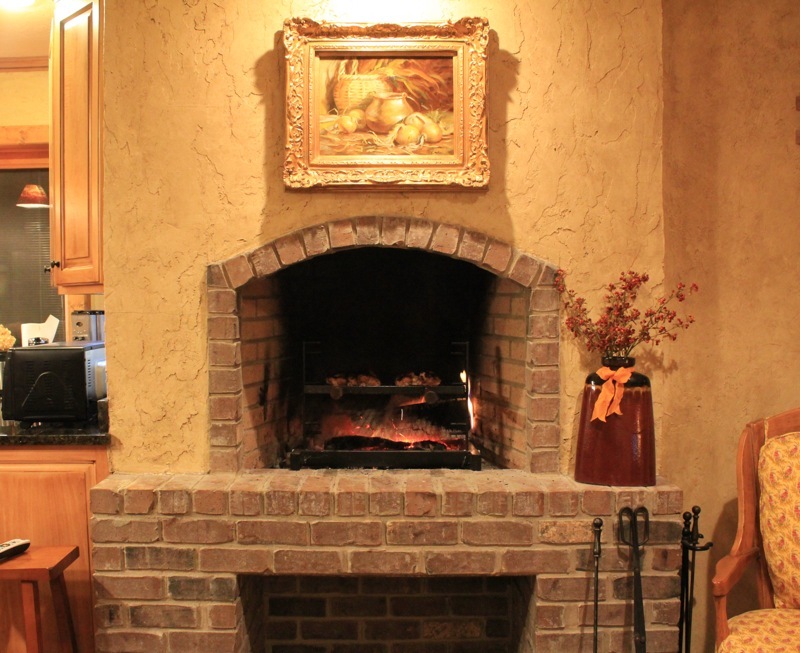 Score the top diagonally in both directions with a knife (about 1/4-inch deep). Mix together the mustard, vinegar and brown sugar in a small bowl. Set aside. 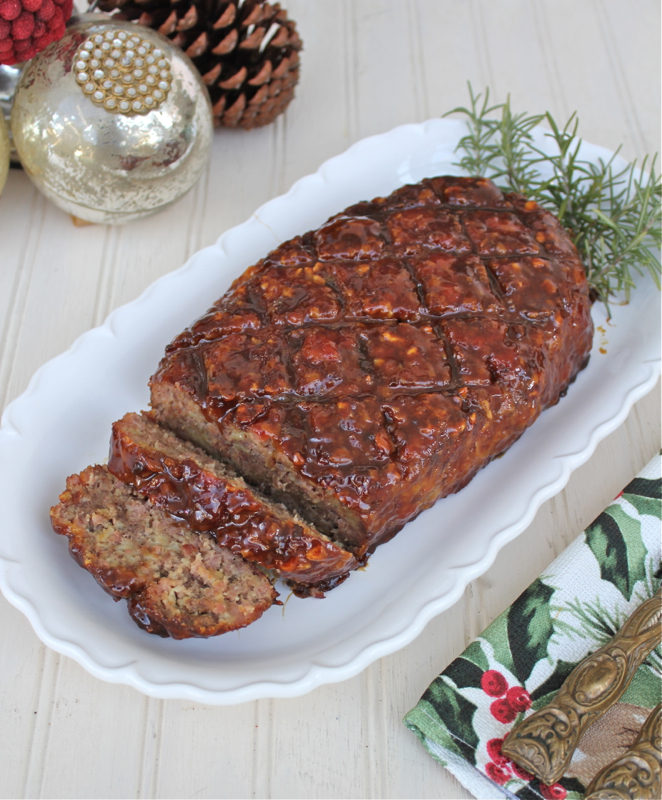 Bake the ham loaf in a 325 degree oven for one hour. Pour sauce over meat and bake an additional one hour, basting frequently, especially during the last 1/2 hour. Place on platter, slice and serve. Posted on December 14, 2014 at 9:08 am. 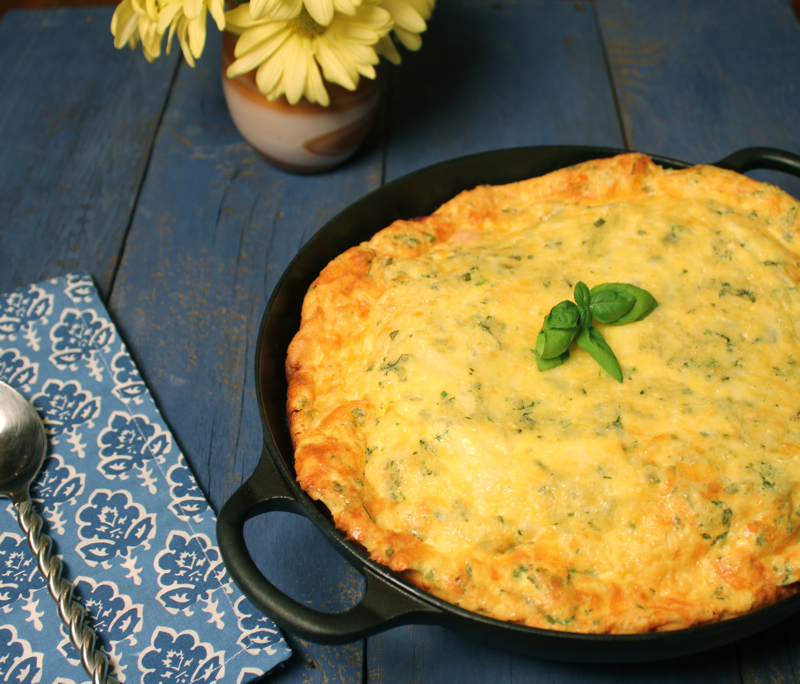 This is an easy breakfast dish and very impressive when it comes out of the oven. Photographing it is another story as it deflates rather quickly. But, when cut into and served, it is creamy and luscious. I love the texture of the eggs and the bits of ham and herbs. I have so much basil this year that I am putting it in everything. It holds its own with eggs. But you could use other herbs. This souffle is one of those dishes that is easily adaptable. Substitute sausage or cooked vegetables for the Canadian bacon, parsley or tarragon for the basil, or cheddar cheese for the Gruyere topping. It doesn’t matter. The magic still happens and it comes out of the oven puffy and golden. I liked this so much that I made it two Sundays in a row. This time I used a combination of fresh tarragon and basil. David wants to try it with sausage and cheddar next time. But I am also thinking about that leftover zucchini and corn. I am sure all of you could come up with some wonderful combinations. This is a keeper. In a flameproof 1 1/2 quart baking dish cook the bacon in the butter over moderately low heat for 5 minutes, or until it is golden, stir the mixture to coat the sides of the dish with the butter, and remove it from the heat. In a bowl whisk together the cream the flour, the eggs, the basil and the salt and pour the mixture into the dish. 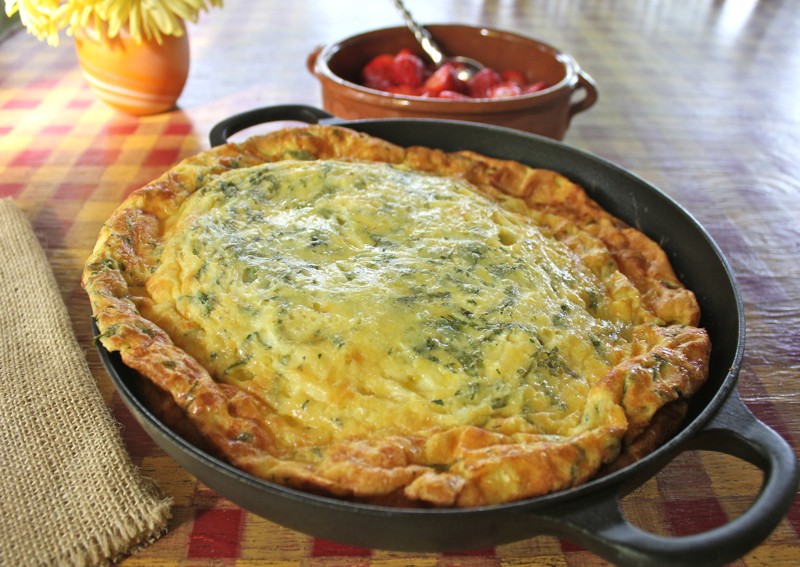 Sprinkle the mixture with the Gruyere cheese and bake it in a preheated 450 degree oven for 15 to 20 minutes, or until the omelet is puffed and golden. Serves 4 to 6. Posted on May 28, 2014 at 6:45 am. There are many foods that we associate with Easter; ham, eggs and chocolate bunnies to name a few. 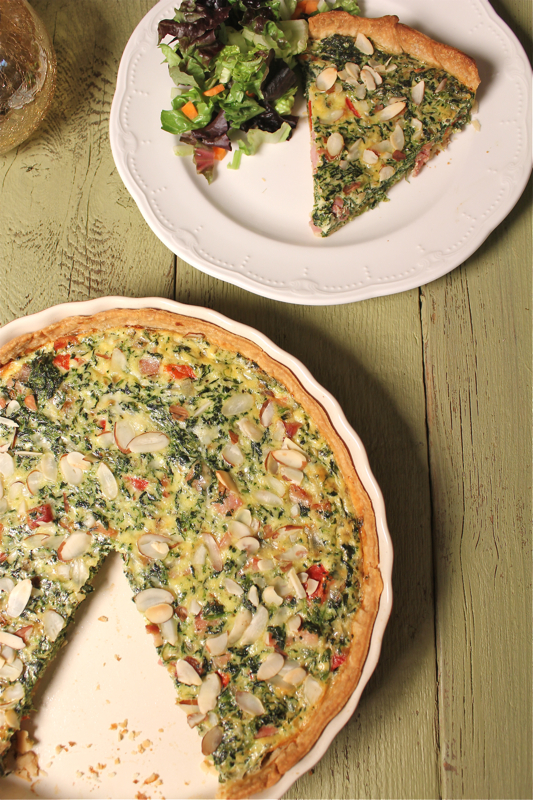 In Italy this Spinach Torta is made around Easter time to celebrate the season. There are many versions of the dish. Some are made with a yeast crust and a lattice top. Some top the dish with pine nuts, instead of the almonds that I used. I added ham to my version. To me this would make a perfect brunch dish to celebrate Easter. 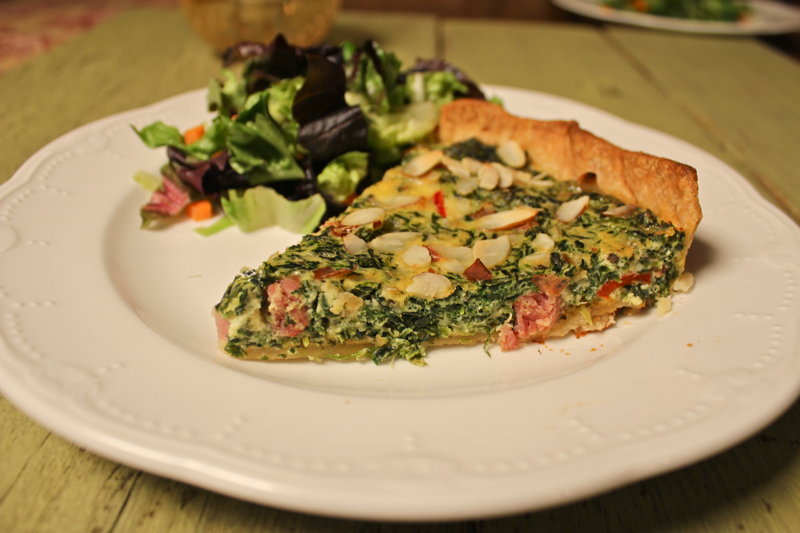 The torta is an Italian version of a quiche. The flavor additions include Mozzarella and Parmesan instead of Swiss or Gruyere, Italian seasonings instead of a hint of nutmeg and a pine nut or almond topping. 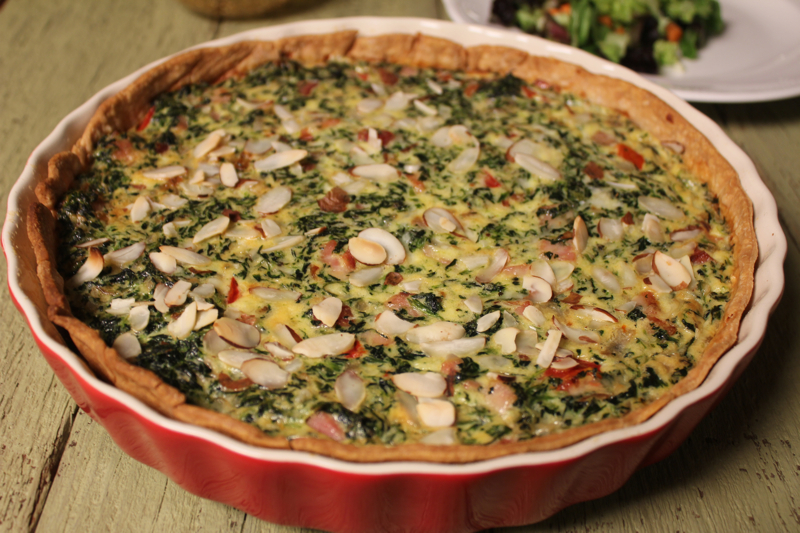 The spinach, eggs, roasted red peppers and cream round out the dish. Since I was in a hurry I used a store bought pie crust, but you could certainly make your own or leave it out completely. I actually made another version of this torta a few years ago that is also great to make ahead of time for a brunch party. Here is the link. This makes me wish for a trip to the Amalfi Coast. Since that is not possible, David and I will be attending The East Tennessee Italian Fest blogger party at Big Dude’s Almost Heaven South on Saturday June 7th. For details see Larry’s post here if you are interested in joining us. I am linking this dish to Tasty Tuesdays at the Comfort of Home. 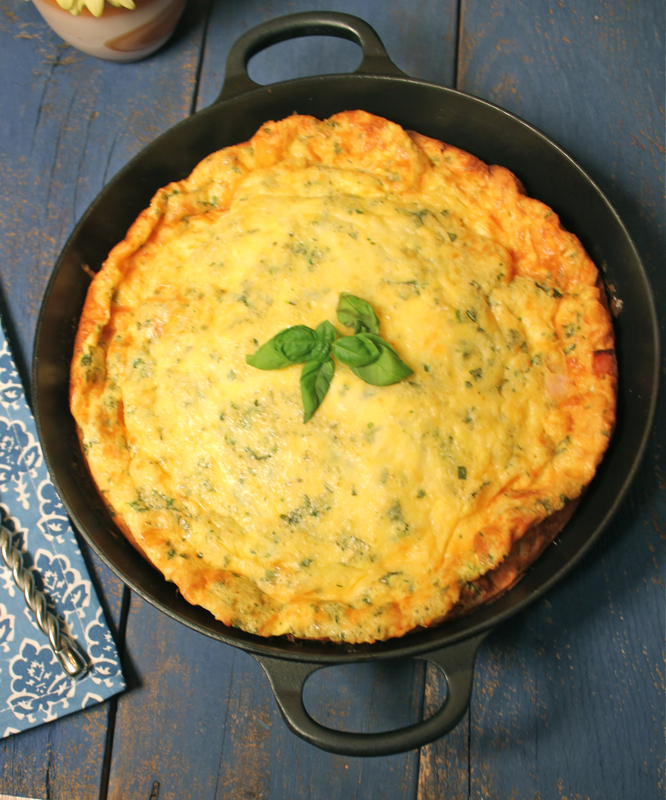 Preheat oven to 425 degrees F. Fit pie crust into 10-inch tart pan or 9-inch pie plate. Blind bake in oven for 5 minutes. Remove foil or parchment paper lined bean weights. Paint bottom of pie crust with mustard. Return pie crust to oven and bake for 5 more minutes. Remove, set aside and reduce oven to 350 degrees F.
Melt 2 tablespoons butter in a large saute pan over medium high heat. Add ham and onions and cook until onions are soft and ham is slightly browned. Add red peppers, spinach and seasonings and cook a few minutes to meld flavors. Beat eggs in large bowl. Add cream and shredded cheeses. Add the spinach mixture from the skillet and stir to combine well. Place in prepared pie crust. Sprinkle almonds over the top. Place tart pan in oven and bake for 25 to 30 minutes or until custard is set. Posted on April 18, 2014 at 4:51 pm. I have been a faithful follower of all of Julia Child’s recipes for a long time. Every one of them works well if you follow the instructions. As Julia and her collaborators Simone Beck and Louisette Bertholle devised Mastering the Art of French Cooking, nothing was left to chance. Each recipe was meticulously tested and refined. When volume two of their book came out, sans Louisette Bertholle, both Julia and Simca (as Simone Beck was affectionately known) scored another fine publication. But, by this time, tempers were flaring between the two dear friends. 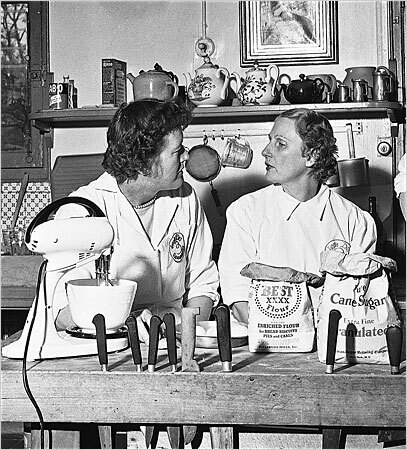 Simca was very opinionated about the superiority of French cuisine and argued with Julia about cooking methods needed to translate recipes to the American kitchen. She was also beginning to feel slighted by the popularity and recognition that Julia was receiving because of The Mastering books and her television show. Simca had her own way of doing things and felt that many of her recipes were left out of the second volume of Mastering the Art of French Cooking. One of the recipes that she wanted included in Mastering II was a Pork Roast that she had developed. Julia, knowing that the book was too far along in the publication process, had to veto the recipe. There was no time for testing and preparing it for inclusion. After Mastering the Art of French Cooking Volume II was published, in part to placate Simca, she was offered the opportunity to publish her own cookbook called simply Simca’s Cuisine. 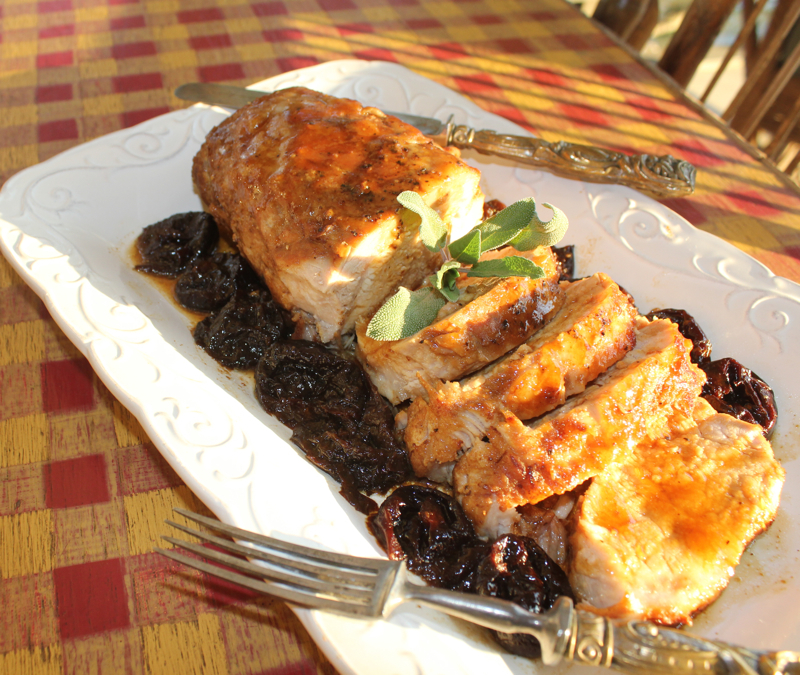 One of the first recipes in the book is Pork Braised with Bourbon and Prunes. I am assuming that this was the recipe that she had wanted to include in The Mastering volume. I made this pork roast recipe last week. I give Simca high praise for the flavor combinations in this dish. The pork is slathered with Dijon mustard and rolled in brown sugar before being sauteed and then braised in bourbon that is first flamed in the dish. The prunes are a perfect accompaniment. But I did not lard the dish with pickled tongue as suggested. Who of us home cooks has a larding needle or has easy access to pickled tongue? She did offer the alternatives of prosciutto or smoked ham, but I was still put off by this step. I also found the cooking time of 1 3/4 hours much too long for the pork. It was dry. Maybe the larding would have made a difference. The sauce made with the bourbon juices offset the dryness. To me it was a good recipe that needed tweaking. You can find my version of the dish here. The second recipe that I tried, Molded Casserole of Ham and Mushrooms with Macaroni, Cheese, and Cream, did not work at all. It had such promise. I was excited about cooking the quiche-like filling in my charlotte mold. It was supposed to be unmolded onto a plate and then drizzled with a tomato cream sauce. One of the instructions was to cook the macaroni and then chop it up, after draining well. This made absolutely no sense to me, but I did it anyway. After baking everything in the charlotte mold, I flipped it over onto a plate and it had not set up. Everything just puddled out. Since this was supposed to be dinner last night, I just put it all into a casserole, rewarmed it and served it. The flavors were great. 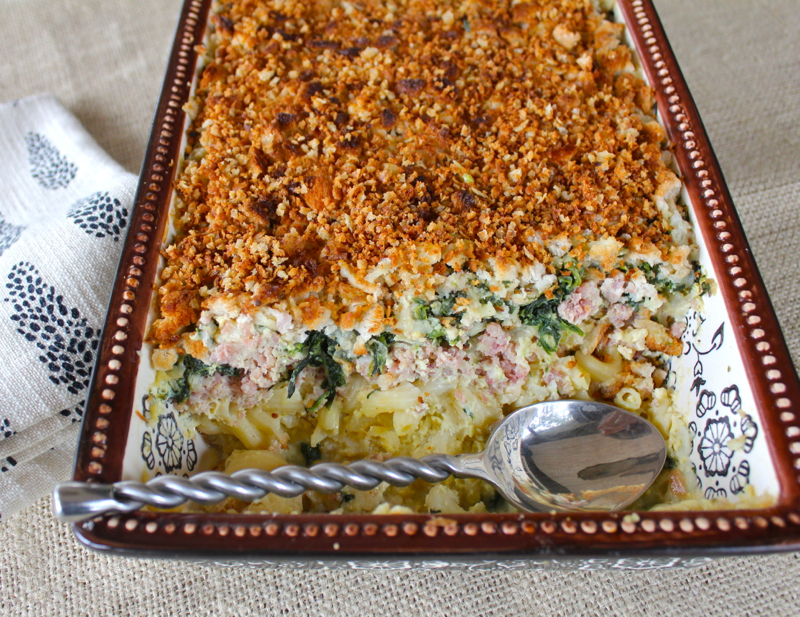 I would make this again as a casserole. 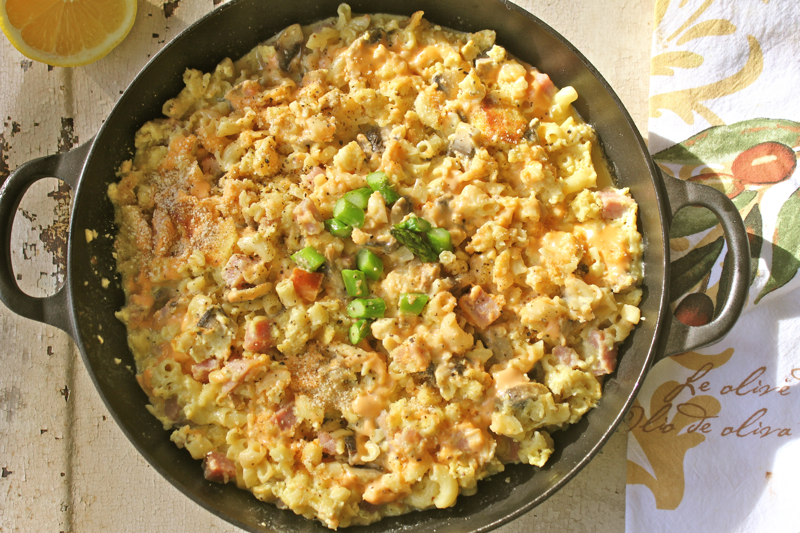 It is like a sophisticated macaroni and cheese with ham, mushrooms and Gruyere cheese. So I guess the moral of this story is that Julia Child knew what she was talking about. When you publish a cookbook it is best to test and retest. Simca’s recipes are inspiring. They have great flavor, but the techniques do not always work. 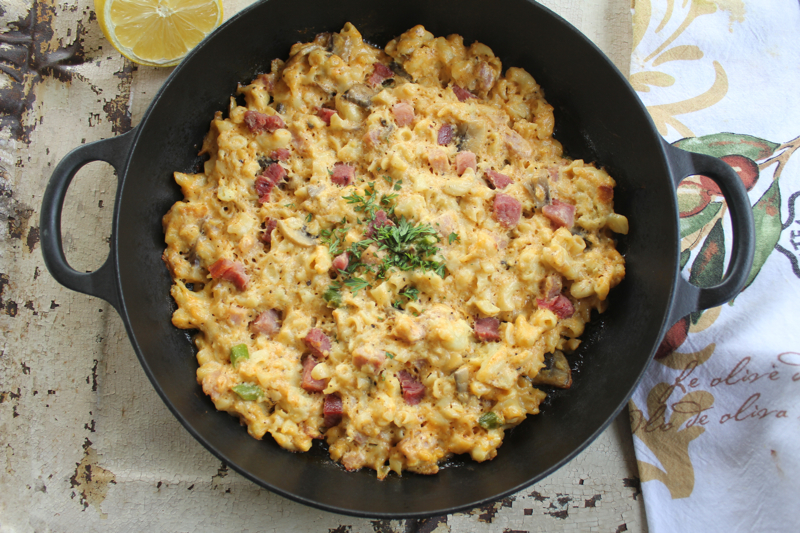 Here is my version of her macaroni and cheese. I hope my techniques and flavors work for you. Butter a heavy casserole dish. Cook the macaroni in a large quantity of boiling salted water until barely tender. Refresh under cold running water, drain, and dry on paper towels. Combine with the diced ham. Clean the mushrooms and slice. Sprinkle them with the lemon juice. Melt the butter in a large frying pan, add the mushrooms, and saute, stirring, for 2 to 3 minutes. Salt lightly, pour in the light cream, and simmer for 15 to 20 minutes until the mushrooms are tender and the cream has almost evaporated. Drain if necessary. Beat the eggs thoroughly with the heavy cream and the grated cheese. Add the mushrooms, macaroni, and ham, and season highly with salt, pepper, and nutmeg. Mix thoroughly and put mixture into casserole. 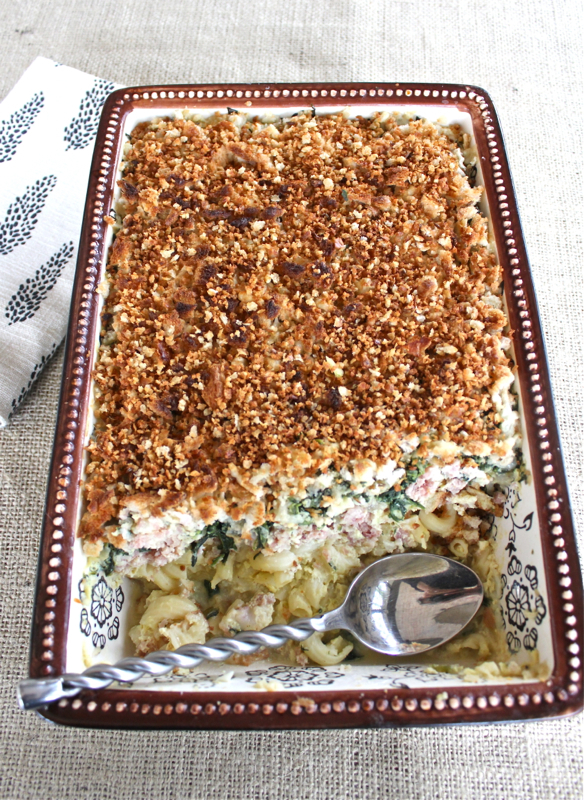 Cover casserole with lid or foil. 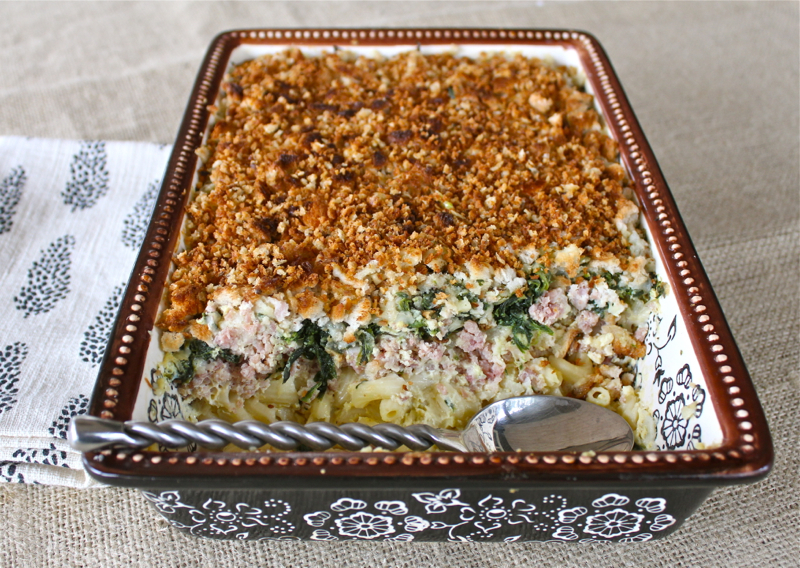 Bake casserole for about 30 minutes. Posted on April 7, 2014 at 8:36 am.